With Star Wars all the rage, James Bond gets his own space opera. Moonraker is extremely silly and immensely entertaining, one of the most over-the-top and bombastic entries in the series. A Moonraker space shuttle is hijacked off the back of an RAF transport 747. Finishing a mission, James Bond (Roger Moore) survives a free-fall from an airplane and fends off an assassination attempt by Jaws (Richard Kiel), his foe from The Spy Who Loved Me. Bond is then assigned the task of finding out what happened to Moonraker. He visits the sprawling California compound of Drax Industries, the company that builds the shuttle, and meets the mysterious and extremely wealthy Hugo Drax (Michael Lonsdale). Bond receives help from Drax's helicopter pilot Corinne (Corinne Clery), meets on-loan NASA scientist Holly Goodhead (Lois Chiles), and tangles with Drax's assassin, martial arts expert Chang (Toshiro Suga). The trail leads to a glass manufacturing operation in Venice, where Bond uncovers a nerve gas, deadly to humans but harmless to animals, being packaged into vials and special spheres. He dispatches Chang and forms an uneasy alliance with Goodhead, revealed to be a CIA agent also investigating Drax. The next stop is Rio de Janeiro, where Jaws makes a reappearance, now working for Drax as a replacement for Chang. Finally Bond tracks down the plot deep into the Amazon jungle, where Drax has readied six Moonrakers to transport a group of perfect human beings to an orbiting space station, from where the nerve gas spheres will be dropped onto Earth, annihilating humanity. Moonraker was rushed past the previously planned For Your Eyes Only to cash in on the surge in popularity of science fiction movies ignited by Star Wars and Close Encounters Of The Third Kind. 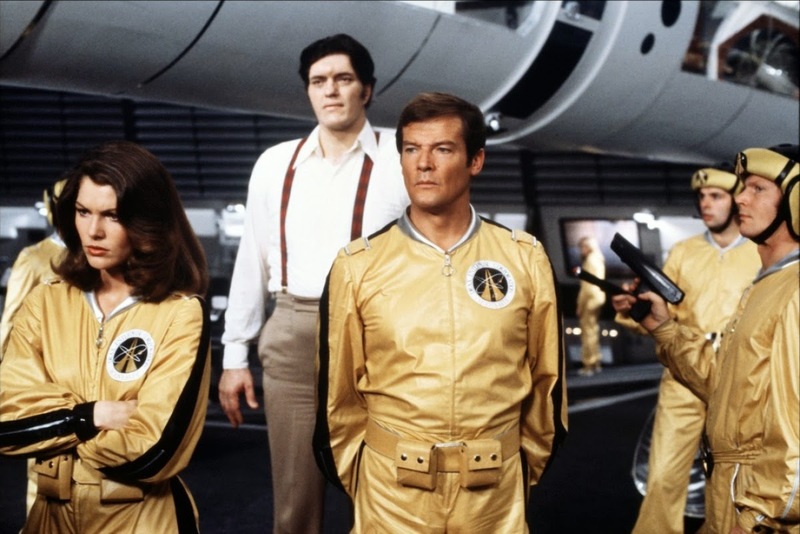 Pushing the successful formula of The Spy Who Love Me beyond the limit, Moonraker often errs on the side of campy humour, an attitude that risks diminishing the adventure to farcical levels. Even by Bond standards, the plot, a rehash of Spy but set in space rather under the ocean, does not survive any level of scrutiny. But the film's weaknesses have more to do with too much Jaws, too many blatant product placements, and some extremely limp chase sequences. Two separate boat action sequences sink without a trace, a particularly insipid gondola chase in Venice is played for cheap laughs, while a motorboat chase in the Amazon is mind numbingly predictable. That Jaws finally changes sides and falls in love summarizes how hard Moonraker was trying to appeal to the inner child within the audience. But Moonraker also offers up grand, big-budget fun. The opening free-fall battle for a parachute stunt is ridiculously audacious, and the fight between Bond and Chang in the Venetian glass showroom is a gem. Also clever is Bond outsmarting Drax's sniper with a hunting rifle. Bond gets to bed a succession of women, Corinne, Holly and Brazilian contact Manuela (Emily Bolton) all succumbing to his seduction, while the final I think he's attempting re-entry, sir double entendre is simply classic. Moore is in fine form, if just on the wrong side of the required physical fitness. When the plot moves to space, scenes alternate between satisfying and clunky. The film preceded any actual space shuttle launches, and deserves high marks for reasonably accurately portraying what would become routine only several years later. The space travel special effects are good for the era, and Drax's space station is an impressive, fantastical creation. While the laser battle in space is botched into incoherence, Gilbert reliably delivers the requisite high energy climactic action within the space station. Moonraker is breathless and sometimes out of breath, Bond's most inflated adventure with too much of everything, quantity overpowering quality but doing enough to maintain the momentum of the series into a new decade.